This little Crochet Ring Pattern takes less than an hour to make, and it adds the perfect crafty touch to any outfit. Crochet jewelry patterns make the perfect accessory for women of all ages, and this crochet ring is perfect for using up yarn. If you have some leftovers in your stash and can't bear to throw them away, consider working on a crochet jewelry pattern. This small but mighty project is sure to make an impression on everyone you meet. Cl (cluster): Yarn over, insert hook in indicated st or sp, yarn over and draw up a loop, yarn over and draw through 2 loops on hook; [yarn over, insert hook in same st or sp, yarn over and draw up a loop, yarn over and draw through 2 loops on hook] twice, yarn over and draw through all 4 loops on hook. Remember to check gauge for best results! Adjust hook size if necessary to obtain correct gauge. If you're short on time but in the mood to crochet, this free downloadable eBook is perfect for you. 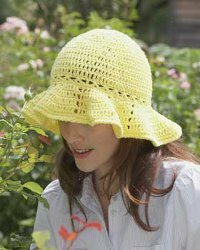 With the help of 25 Quick and Thrifty Free Crochet Patterns, you can create everything from crochet flowers to cute wearables. These free crochet patterns make great gifts and look like they took forever to complete. Be sure to make a few and save them for important occasions like the holidays or a friend's birthday. Make it just your size! Work more or fewer chains in the ring band for your perfect fit. Ch 5; join with sl st in first ch to form a ring. Round 1: Ch 3, dc in ring (beginning ch-3 and next dc count as one cluster), ch 3, [Cl in ring, ch 3] 7 times; join with sl st in top of beginning ch—8 clusters and 8 ch-3 sps. Round 2: Ch 3, sl st in top of next dc, ch 4, (sl st, ch 3, sl st) in next Cl; ch 9 (first half of ring band made); (sl st, ch 3, sl st) in next Cl, [ch 4, (sl st, ch 3, sl st) in next Cl] 3 times; ch 4, sl st in 5th ch of first half of ring band, ch 4 (ring band completed); [(sl st, ch 3, sl st) in next Cl, ch 4] twice; join with sl st in first sl st. Fasten off. Ch 4; join with sl st in first ch to form a ring. Round 1: Ch 1, [sc in ring, picot, ch 1] 6 times; join with sl st in first sc—6 sc, 6 picots, and 6 ch-1 sps. Round 2: Ch 8 (counts as dc, ch 5), [dc in next ch-1 sp, ch 5] 5 times; join with sl st in 3rd ch of beginning ch— 6 dc and 6 ch-5 sps. Round 3: Ch 1, sc in same st as join, picot, ch 3, sc in 3rd ch of next ch-5 sp, picot, ch 3, sc in next dc, picot, ch 3, sc in 3rd ch of next ch-5 sp; ch 7, sl st in 7th ch from hook (first half of ring band made); [ch 3, sc in next dc, picot, ch 3, sc in 3rd ch of next ch-5 sp, picot] 2 times, ch 3, sc in next dc, picot, ch 3, sc in 3rd ch of next ch-5 sp; ch 3, place marker in 3rd ch from hook, sl st in 4th ch of first half of ring band, ch 3, sl st in marked ch (ring band completed), ch 3, sc in next dc, picot, ch 3, sc in 3rd ch of next ch-5 sp, picot, ch 3; join with sl st in first sc. Fasten off. Round 2: (Sl st, ch 3, dc) in first ch-1 sp (counts as first cluster), ch 5, [Cl in next ch-1 sp, ch 5] 5 times; join with sl st in first dc—6 clusters and 6 ch-5 sps. Round 3: Ch 1, sc in same st as join, picot, ch 3, sc in 3rd ch of next ch-5 sp, picot, ch 3, sc in next Cl, picot, ch3, sc in 3rd ch of next ch-5 sp; ch 7, sl st in 7th ch from hook (first half of ring band made); [ch 3, sc in next Cl, picot, ch 3, sc in 3rd ch of next ch-5 sp, picot] 2 times, ch 3, sc in next Cl, picot, ch 3, sc in 3rd ch of next ch-5 sp; ch 3, place a marker in 3rd ch from hook, sl st in 4th ch of first half of ring band, ch 3, sl st in marked ch (ring band completed); ch 3, sc in next Cl, picot, ch 3, sc in 3rd ch of next ch-5 sp, picot, ch 3; join with sl st in first sc. Fasten off. Girly girls, this one's for you. Check out 29 Free Flower Crochet Patterns and Other Girly Crochet Projects and discover fun and flirty projects to make and wear. This collection of free crochet patterns includes ideas for sweaters, accessories and even kitchen decor. You'll find everything from easy crochet patterns to more complicated designs, so you'll want to save this list forever. These crochet thread rings are comprised of cluster stitches and picots. It's very hippy chic! Start a new trend with these crochet rings. It like silver, however, I think they could use two tones in one ring to make them pop and stand out. Mix the silver with gold, or do a gold ring with the center clusters in a gem stone color like a ruby or a sapphire! This is a beautiful crochet ring pattern! These would be great to make for those last minute gifts. The designer has included three different ring patterns for you to make. The written instructions are very clear and there is even a link to a page with the stitch diagrams on it for those who prefer to follow patterns that way. How many have YOU made? These are just great, thank you so very much for sharing. I love to make jewelry and to crochet so these will feed In to both myself passions. I love the designs. I have tons of small 2 and 3 mm beads in all colors to add to these also. Finally, I may actually make something for myself. Love it! So pretty! So elegant!!!!!!! Love it.. This is so elegant and could be worn casual or a dressy evening out.. This is so pretty! I may just have to learn to crochet! So glad you liked it! If you need help learning, you can visit www.allfreecrochet.com. They have lots of helpful tips and suggestions. Good luck! I like the rings better than the earrings. These are sooooo cute !!!! If I can't seem to crochet them myself (I am a very beginner), then my sister owes me these for something--- I gotta have some of these! Looks really cool!! Can"t wait to make it. Thank you! I love the ring pattern! I also think it would be great to make a matching bracelet, and maybe a matching pin or necklace. Great ideas! I think a bracelet would be stunning. I like this ring..I have made several thanks for the pattern.. I also made some and added beads!!! So glad you liked it! Ohh, I bet the beads were beautiful! I certainly love this more than the earrings, I'm gonna try making it this weekend! i just love the ring (better than the earrings) can't wait to make it. @sacstmom If you're just starting, be sure to check out allfreecrochet.com for lots of great tutorials and tips for beginners. Once you get the hang of it, it's a blast! Good luck! I like these better than the earrings, so sweet! @shelleymcelhiney So glad you liked it! Thanks for the comment! I definitely like this much better than the earrings posted. I have actually made 2 of these so far, with added beads. I tried stiffening one with glue, it turned out ok, but the ring lost some of the detail. I am going to try other means to see if I can get exactly the look I am going for. Great idea! If you find something that works, we'd love to hear about it on our facebook wall (www.facebook.com/favecrafts). Maybe I'm just not shopping in the right places, but I've never seen size 5 crochet thread at my local craft stores. Plenty of size 10 and size 3, but no size 5. Has anyone tried a different size thread? I have seen size 5 at both Joann's and Michaels. Joann's was online though so I am not sure how much is in stock at the store. At Michaels I have purchased three colors so far, a sage green, black, and dk pink. Just an added note these can be easily made with size 10 thread, that is what I used, because the size is the connected chains in the back. I used a 1.75mm crochet hook for the size 10 thread. @jungle40jane So glad you liked it! Thanks for the comment! Definitely the rings win! I just love them. Bought the yarn awhile ago but still haven't gotten around to making them. I really like the crochet ring idea. I have never seen anything quite like it. And it's pretty. @mummsie So glad you liked it! Thanks for the comment! I love the look of this ring, and will be making very soon. @michbeth So glad you liked it! Thanks for the comment! @mamawolfe140 So glad you liked it! Thanks for the comment! I love the ring it looks so elegant I want one but I cant crochet so thats the next thing to learn on my list. Just lovely. @suttiz Great goal! Be sure to check out allfreecrochet.com for helpful tips and tutorials! Good luck! This is a great gift for seniors. My Mother wears hers all the time. No worry about showers, washing hands, or getting lost. Crochet in a color for every outfit (even if it is gown). @MissRitz4 What a great idea! It's comfortable to wear and easy to take off or put on. Thanks for the comment! I love this ring! Every time I see this beautiful ring I want to make it! I'll get around to it one day, but mine will be RED!! LOVE IT!! My vote is for the ring. Super cute idea! @Krimmkat So glad you liked it! Thanks for the comment! I vote for the ring. I would like to buy one!! @ttspears So glad you liked it! Thanks for the comment! I LOVE this ring!! I have tried to make it, but it has never worked out. I am still working on it! I love this ring. It is such a great accent to any outfit and I have lots of young ladies for whom to crochet. Thank you for this pattern. I absolutely LOVE the crochet ring!!! This gets my vote all hands down! I love the rings! The earrings should not be voted on with these rings!! there is no comparison. The work is so much more detailed in the rings and much harder to make. The earrings are great for a very quick project. @Becki So glad you liked the pattern. Thanks for the comment! Although the earrings are a novelty, I much prefer the rings. They are simply stunning!! @sdsemail Thanks for the comment! Glad you enjoyed the pattern! @sallyjenn Would have to agree! Thanks, Sally! I love this ring. I think its unique and very classy. It can be worn with any type of clothing. Just love it. @Crafter thanks so much for the comment and we're so glad you like the pattern! I like the rings better than the earrings! I love this one, much more than the other. The other looks like a fur matt, hanging off an ear wire, and I don't care for it at all. This is delicate and has some actual design to it. I'll definitely be making it. @dotrocka1 So glad you liked the pattern! Thanks for the comment! Just love this! This would be gorgeous in white for a bridal finger loop or for Halloween in black. So pretty and versatile! Oh how I wish there was a TV program on crochet here in Arizona!! @diniridawn So glad you liked it! Thanks for the comment! I love this little ring. I don't believe one could KNIT something like that or am I wrong? @willekeo Good question. It might be hard to knit a pattern just like this one, but you can find lots of great knit accessories at our sister site, AllFreeKnitting.com. Hope you find what you're looking for! A little tip on these.. If you use elastic thread they can fit better for some people ;oD I love this pattern. @ksrum great idea! Thanks for the tip! I've made several of these in different colors. They make good last minute gift ideas and are fun to wear. @suki146 So glad you liked this pattern! And yes, they do make great gifts! Thanks for sharing! @BRAT so glad you like them! Thanks for the comment! @KarenC So glad you liked the pattern! Be sure to check out our friends over at AllFreeCrochet.com and AllFreeJewelryMaking.com for more fun accessories! Pearl Cotton embroidery floss #5 would most likely work too. @JanetTobiasCoverdale Great suggestion! Thanks for sharing! I'm having difficulty finding #5 crochet cotton at my local craft store. Any ideas for where one could find it on the Internet? @AlyceD You could try looking at Amazon.com or see if the designer of the yarn has a website where you can order directly. Otherwise any thin yarn should do the trick. This is neat. I'd make a bracelet to match - with maybe a bead stitched in now and then in a pattern. Napkins rings also come to mind with a crocheted table runner. Anyway, this is nice. @kk22crafts Both great ideas! I think a matching bracelet would be perfect! And the napkin rings would be beautiful for winter or spring. Thanks for sharing that great idea! Thank you for giving diagrams as well. I'm Dutch and have to use a list of the abbreviations used in crocheting, but can read a diagram without any problems. Love the rings for other purposes as well. @Annabelle So glad you liked the pattern! Thanks for the sweet comment!